PDI is pleased to be able to provide you with an accurate and timely rate. On The Road Again Article: First Driver Interview – I waited at the PDI gate for driver Will Fisher to arrive back from Buffalo. 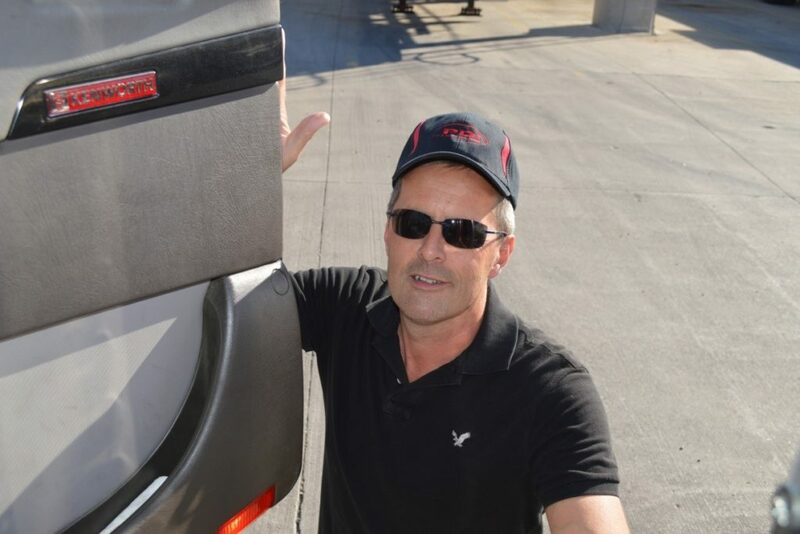 Will is driving a 2013 Kenworth T134. PDI does not slip seat trucks, so Will drives the same truck every day. It’s been his since it was new and together they have experienced 255,000 kms of road. T134 is a day cab, which means this truck is used for short hauls. Will Fisher has been with PDI for nine years. He started in 2007 as a dry bulk tanker driver in the pellet division, but moved quickly into the chemical liquid division. When I talked with Will, he vividly remembers his first PDI driver trainer, Al Dee, and the influence on him. Al has retired from PDI, but still drops in to visit the staff here and attend company barbeques. Today Will is hauling a load of Polyol. 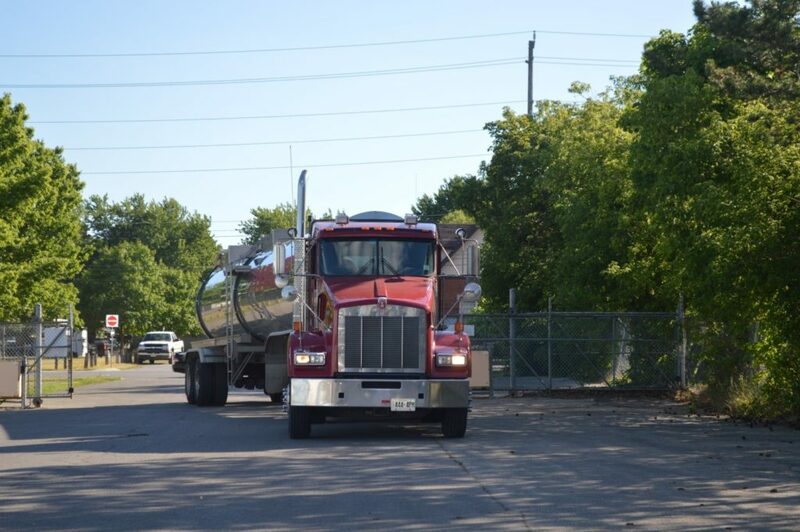 He drove to Buffalo with an empty tanker and picked it up from CSX rail in Buffalo and hauled it back to one of PDI’s Guelph yards. The tanker is L23, a 2 axle tandem, stainless steel liquid tanker. This tanker is dedicated to hauling Polyol. Polymeric polyols are generally used to produce other polymers. They are reacted with isocyanates to make polyurethanes used to make mattresses, foam insulation for appliances, home and automotive seats, etc. The load being hauled today will be used in the manufacture of automotive seats and office chairs. L23 has a legal gross weight of 80,000 lbs in the US and 88,000 lbs in Ontario. This means Will is hauling about 47,000 lbs of product. Will has been driving professionally for 25 years. His dad was an owner operator and his uncle owned his own trucking company, so he has been around trucks all his life. Former jobs include driving dry van long haul to Florida, Georgia, Texas and every state in between, but got off the long haul when he married and started a family. Will considers long haul driving a young man’s job. These days, Will and T134 haul mostly to southern Ontario, Buffalo and the GTA. Dispatcher Tracey Campbell would have scheduled his polyol load yesterday. Will sees his next day dispatches on his Peoplenet unit; the trucks time management and tracking system. Dispatch also follows up with a text to his phone to ensure communication is received. When Will arrives at the CSX railyard at his appointed time, our PDI CSR (Customer Service Rep) Heather McGhie and in this case the customer, have already faxed through the load information and documentation. The CSX receiver is waiting for him. The railyard loader will load the polyol, from railcar to tanker truck. 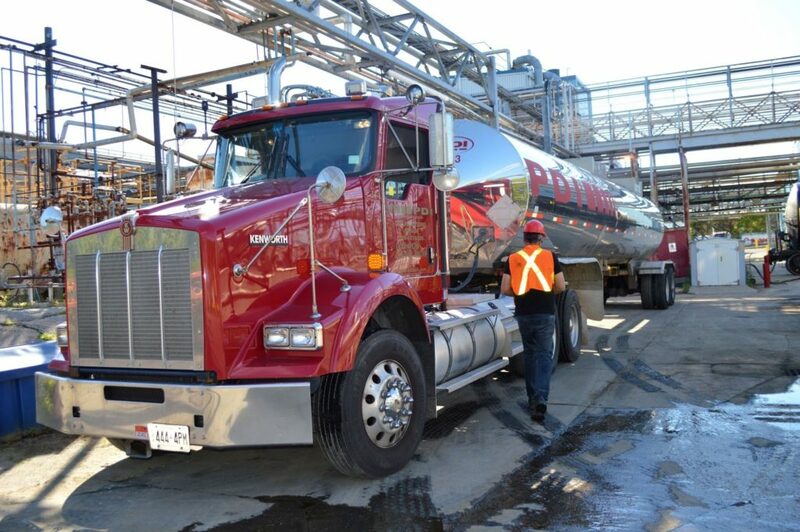 Driver Will hooks up and secures his own hoses, verifies the load, the product, the tanker and the railcar. Someone else may load the tanker, but ultimately, the unit is the driver’s responsibility. Will has experience hauling a variety of chemicals including: Hydrochloric Acid (HCL), Caustic Soda (Sodium Hydroxide), Triproplylene, Polyols, fire retardants and more. He has received training on Safe Handling Procedures on every product he comes in contact with. PDI also provides annual training updates, including safety videos, emergency response, on the job training, WHMIS specific training, and classroom lectures. Many customers also supply onsite training at their facilities. Five years ago, Will completed the Train-the-Trainer courses and became a PDI Driver Trainer. He says that he enjoys passing his experience and knowledge on to other drivers. Once loaded, CSX staff complete the paperwork and seal the trailer with PIP metal security seals. Will completes his inspections and has the eManifest and the Bill of Lading with the PARS stickers to accompany his load. Customs paperwork is automatically directed to the border crossing customs office. Drivers cross at the commercial section of the borders. Will produces his FAST card and quickly passes through to Canada. Drivers who do not have FAST cards must go inside at the border and get a manual release. It takes about 6 hours from start to finish to complete the round trip. Back in Guelph, Will knows this load will not get delivered until tomorrow. Right now the load is at 95 degrees C, so he drops the tanker off in a steam spot. PDI loaders will steam it in the morning. It must be 100 – 120 degrees C to be delivered. CSR Heather will send a steam log to the scalehouse notifying the loaders that the tank is there. PDI driver trainer Will Fisher hooking up to FRP (fiberglass reinforced polyethylene) tanker L38. This tanker will be used on a Hydrochloric Acid (HCL) load in the morning. So what makes a good driver? Will thinks it is being attentive; understanding your surroundings and be aware of what is going on. You also need a good temperament to deal with all the aspects of the job. Dealing with impatient drivers on the road can be the most challenging aspect. Will notices that everyone seems to be in such a hurry. Then what makes a good chemical driver? Will says it is understanding that safety comes first. Take a good, experienced truck driver and give him excellent product knowledge. If a good driver understands what they are doing and what they are handling and hauling, it gives them the confidence to take the responsibility seriously, safely and professionally. Will enjoys the respect that his job offers him. Good chemical drivers are treated with high regard by other drivers, at customs, by employers and at the customer. Both the employer and customers have confidence in their ability. These drivers know what they are doing. Will says he could never work in an office environment. Being a driver allows him to put his experience to good use every day and the freedom to be on the open road. 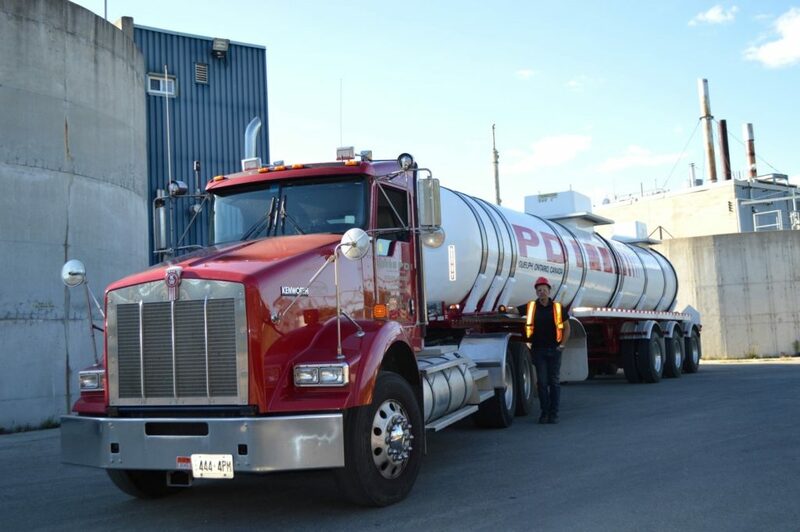 One of the largest bulk transportation companies in Canada with an un-matched portfolio of services catering to the Polymer, Chemical, and Food industries.